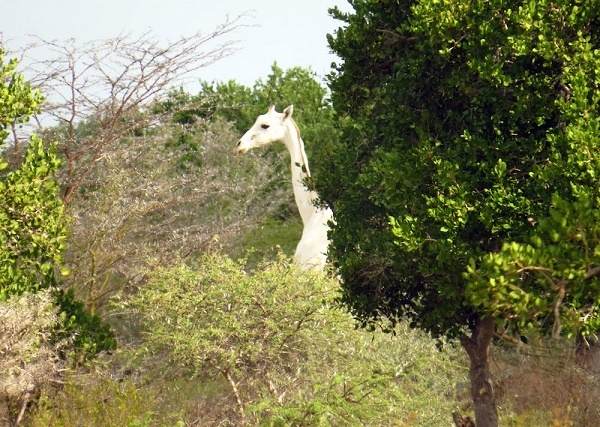 I Spy Animals: Do Albino Giraffes Exist? The bottom left one especially is amazing! A little area of complete black! How did that happen? The bottom right giraffe has normal-colored legs! Weird. He's alive and living wild in Africa, in a herd of normal-colored giraffes. He really stands out. But luckily for this guy; giraffes don't get killed by poachers because there's no "market" for giraffe horns, or skins, or meat. AND, they eat leaves off tall trees, and not farmers' crops. So our "white" wild giraffe may live to a ripe old age! 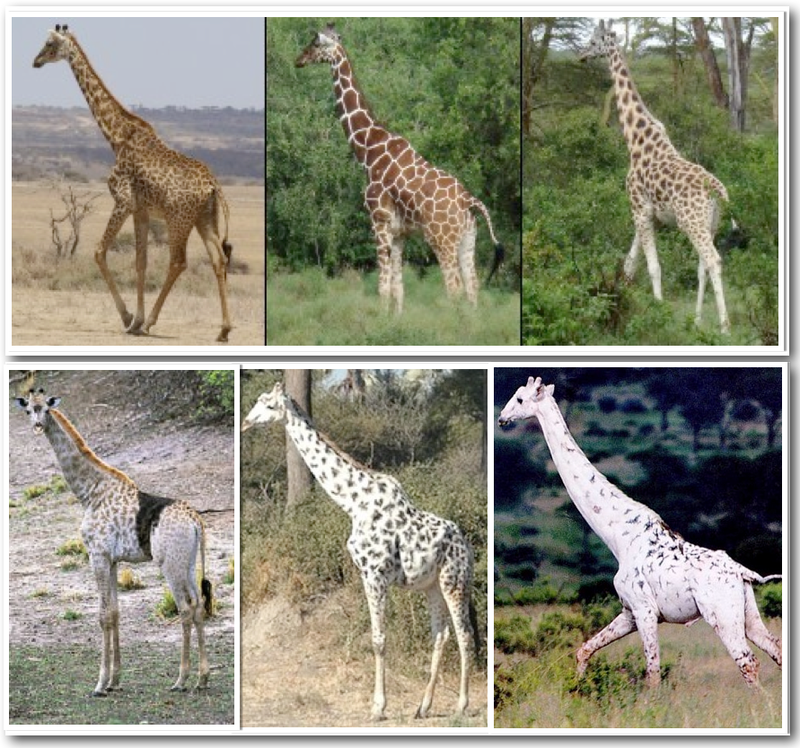 Let me know what you think of "white" giraffes; leave a comment for me! I'm also interested in animal genetics, anatomy, biology, etc., this blog has been interesting to check out. First I was thinking about cattle - would like to know so much but information's hard to find. Then, zebras and now I'm just more sure about my knowledge. I'm a horse freak btw. Giraffes are my favorite animals, but now my favorites are rare unusual giraffes! Pretty much the same, but I love them! I first discovered them in a book called Elephants and Other Land Giants. Albino Giraffe does exist. 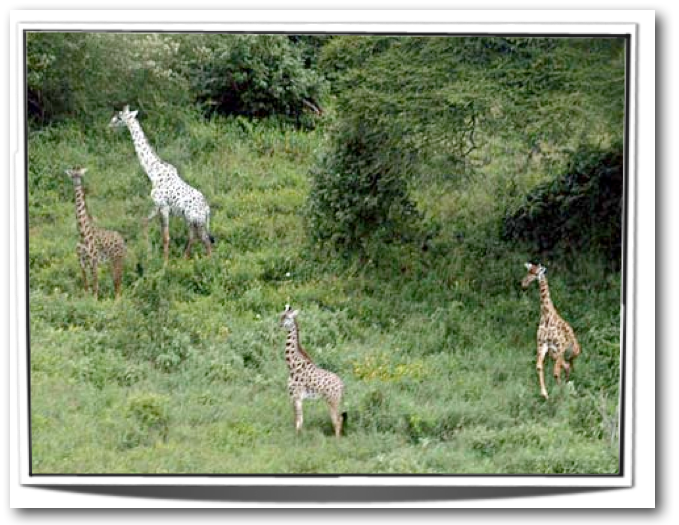 I have a picture from one taken in 2006 in Katavi National Park in Tanzania. I'd love to see a photo of your albino giraffe! Do you have a site you can post it to? The animal at that link, Ken, has leucism, a condition where there is a partial loss of pigmentation resulting in white, pale or patchy colouration of skin or hair. Unlike albinism it is caused by a reduction in multiple types of pigment, not just melanin.